Long term investing makes sense, deposits make cents! Recently I attended a seminar hosted by a major life assurance company in the beautiful surrounds of Páirc Uí Chaoimh, there was an expert panel discussion, an investment update and an Economic outlook, overall I found it a very interesting and thought provoking event. One thing really stuck with me however, a statistic from one of the speakers, that there is presently over €100 billion on deposit in Ireland… (yes you read that correctly) a truly remarkable figure when you consider that deposit rates are at an all-time low and any paltry level of interest you get is liable to a punitive rate of DIRT tax. I chatted to a few of my industry peers afterwards and we all found this figure hard to comprehend. Are some people still reeling from the downturn of 2008/2009? Are people nervous that another stock market crash is around the corner, after all we are 9 year’s into a Bull run! Do people not understand how investments work and rather than engage with a qualified professional people choose the inertia option and decide to bury their head in the sand and do nothing. People are scared of losing money and view keeping money on deposit as the “safe” option. After all two American psychologists Daniel Kahneman and Amos Tversky carried out a study and found that financial losses cause people twice as much pain as the pleasure they receive from financial gain - this phenomenon is known as "loss aversion". Since bottoming out in March 2009 the S&P 500 (the American stock market index based on the market capitalisations of 500 large companies) has returned more than 266%. Historically the stock market has returned an average of 9% a year for more than a century. From 1996 through 2015, the S&P 500 returned an average of 8.2% a year. But, if you missed out on the top 10 trading days during those 20 years, your returns dwindled to just 4.5% a year – this proves the adage of “it’s time in the market not timing the market” that’s important. When you invest in a diversified portfolio you are investing in a number of asset classes (Stocks, Property, Bonds, Alternatives, Hedge Funds and Commodities) across a range of sectors in a number of different countries, whereas on deposit you are investing in one asset class i.e. Cash in one country i.e. Ireland. a) Investments do have a level of risk, so engage with a qualified professional to ensure you have the attitude AND aptitude to take risk. b) You should always have a rainy day fund in place in a deposit account for emergencies. c) If your money is on deposit and is earning little or no level of return your money will “lose” to inflation. 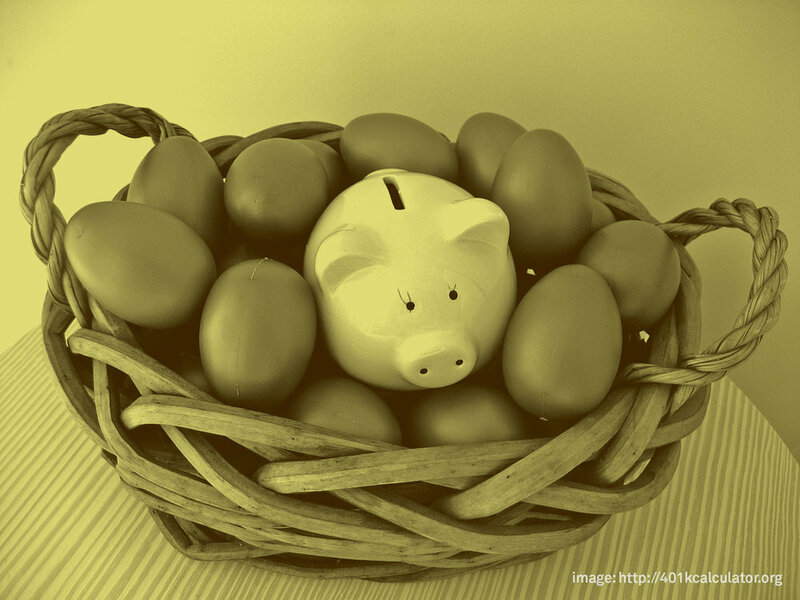 d) As the picture at the start of the article states, don’t have all your eggs in one basket…….diversify to reduce risk and increase potential returns. I’m a huge fan of Warren Buffett, the world’s most successful investor so I will finish on one of his most famous quotes “never depend on a single source of income, makes investments for a second source”. I hope you found this article of interest, if you would like to discuss investment opportunities please phone 085/1126454 or email john@blueprintfp.ie. Older PostSaving for a Sunny Day!